At any given moment, our brains are bombarded with enormous amounts of information. External stimuli from the senses travel through our eyes, nose, or skin, and internal reflections and imagery travel from within. All these stimuli are processed in parallel and compete with each other to become the one single percept which we are aware of at a present moment. 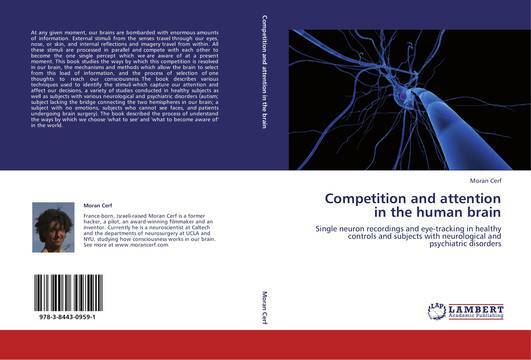 This book studies the ways by which this competition is resolved in our brain, the mechanisms and methods which allow the brain to select from this load of information, and the process of selection of one thoughts to reach our consciousness. The book describes various techniques used to identify the stimuli which capture our attention and affect our decisions, a variety of studies conducted in healthy subjects as well as subjects with various neurological and psychiatric disorders (autism; subject lacking the bridge connecting the two hemispheres in our brain; a subject with no emotions, subjects who cannot see faces, and patients undergoing brain surgery). The book described the process of understand the ways by which we choose 'what to see' and 'what to become aware of' in the world.